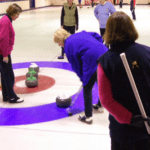 On Tuesday October 21st @7 pm there will be a meeting at the club about the Ladies Cater’s Cresting bonspiel. All ladies of the club are encouraged to be at the meeting in order to give input and hear what has been planned to date. Curling Tips and Tricks Ice Shed Transformation!